Today I’m sharing a few simple front yard landscaping ideas, along with a look at how we totally transformed our front yard flower bed over the weekend! 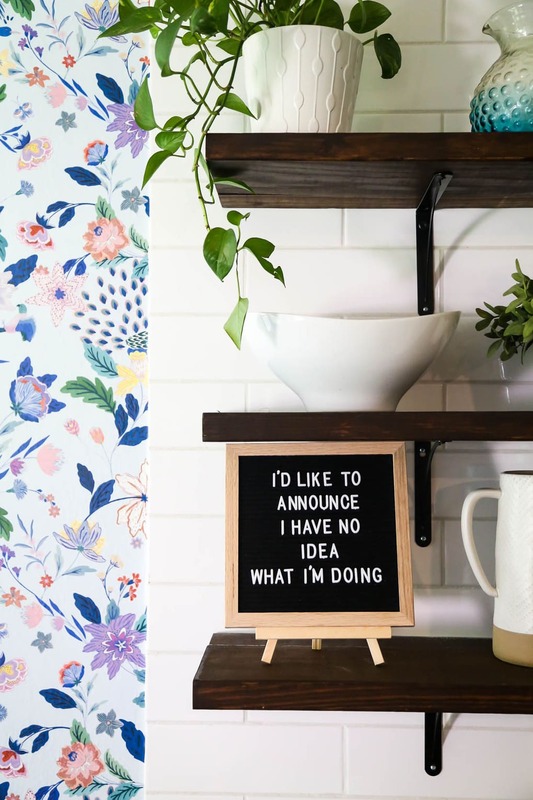 Allow me to be really honest with you today – although I’m generally pretty confident when it comes to interior design, renovations, and making the inside of my house something I can be proud of, I am a hot mess when it comes to the exterior of my house. 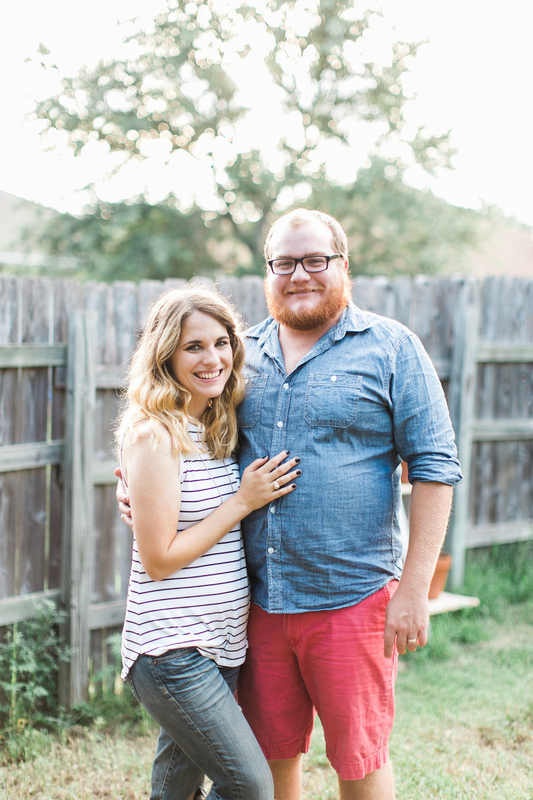 Corey and I often laugh about the fact that our front and back yards tend to look like complete disaster zones – our neighbors would probably be shocked if they saw how well put-together the inside of our house actually is! We’ve never had the greenest of thumbs, and since we’re always in the middle of a project (or seven), there’s generally a lot of random renovation debris floating around outside of our house. 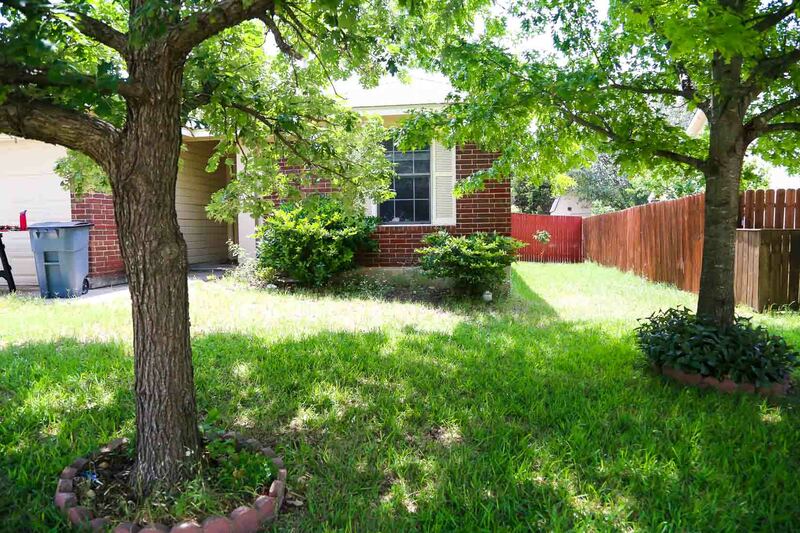 It probably also doesn’t help that we have no idea where to start when it comes to landscaping, and since we haven’t been in love with the landscaping on either of our houses when we bought them, we’ve kind of just lived with it. But, we recently realized that having no idea what we’re doing has never stopped us before. I mean, that’s basically our motto when it comes to home renovations. This post is sponsored by Harvest Organics, but all opinions are 100% mine! Thanks for supporting the brands that support Love & Renovations! So in this house, we’re making an effort to be more intentional about making the exterior beautiful, not just the interior. We already utilize the outdoor space much more than we did in the old house, thanks to the covered patio and shaded backyard, so we might as well do our best to make it a space we can be proud of. One of the things that has driven both of us absolutely crazy since we moved into this home six months ago was the front yard landscaping. It was kind of sloppy, boring, and (since we didn’t do anything to maintain it) just a general disaster. I mean, I don’t need a totally stunning front yard, but walking up to this every single day when I entered my home got really old really fast, and it was time we did something about it. So, when our friends at Harvest Organics asked if we wanted to partner up for a fun springtime landscaping project, we were all in and knew right away that we wanted to try out some simple front yard landscaping ideas that had been floating around in our heads to make things look a little better. Well, I think it looks a lot better. Neither one of us is a big fan of bushes. We don’t maintain them well enough to keep them looking nice, and over the years our bushes have a history of just getting out of control and impossible to maintain. 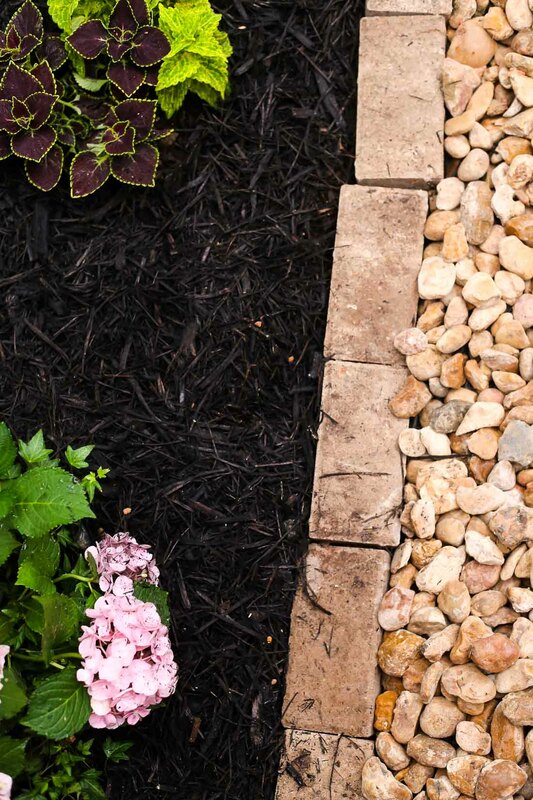 Plus, we prefer something a little more flowery and colorful in our landscaping – especially in the front yard. The bushes that were here when we moved in were growing at wildly different rates and it was obvious that efforts had been made to tame them in the past – you could see where the previous owners had cut them completely back to stumps. One of them was so out of control it was sprouting another bush right next to it! We considered keeping the bushes that were already there, just for the sake of not ripping them out, but in the end, we knew we’d both be happier with something different. We wanted something simple and easy to maintain. I don’t know whether or not I’ve made this clear yet, but we don’t necessarily do a great job of maintaining our exterior landscaping. It’s less that we’re lazy and more that we’re clueless and often bite off more than we can chew. 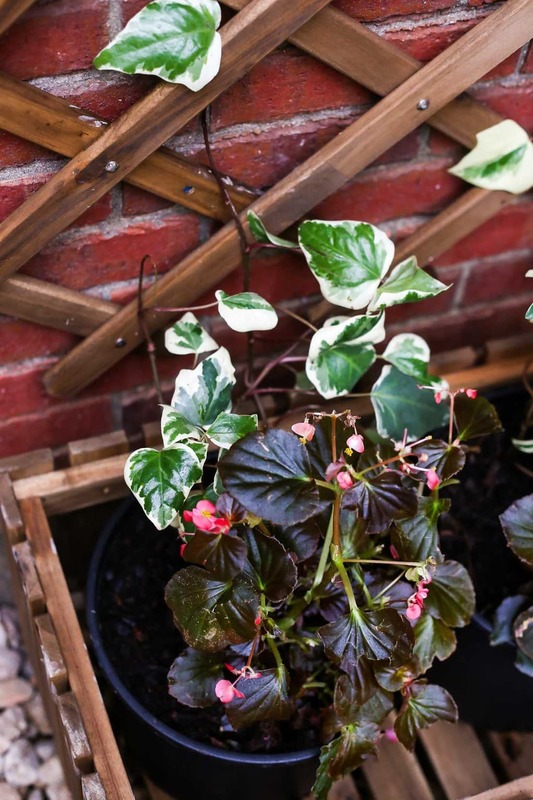 This time, we wanted to choose simple plants that would look nice and be easy to keep alive – plus, we wanted to avoid anything that required tons of pruning! I wanted to remove any living landscaping from the area next to the door. 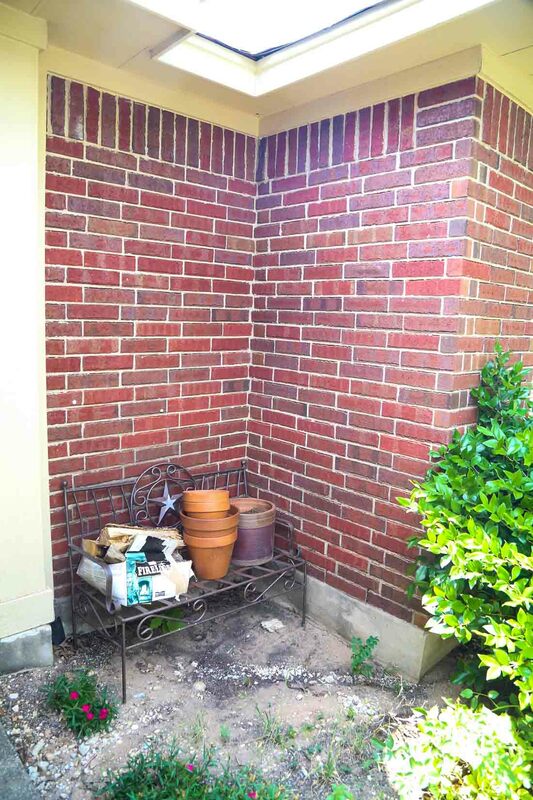 I’m not sure what the goal was with the previous landscaping setup, but other than a few random flowers growing in that nook right next to the door, most of it was just dirt! It’s hard to avoid that area being stepped in and trampled a bit (especially if you put a bench there??! ), so I was doubtful that we’d really be able to grow anything that looked nice. Plus, I felt that plants or additional landscaping made the small entry feel even more cramped – I wanted a more open look that required zero maintenance. Finally, we wanted color! All of our front yard landscaping in the past has been full of nothing but green – bushes, mostly. This time around, we wanted to add some color to the front of our house to make things feel a bit more cheery. We have a couple of beautiful trees in the front yard (and if you squint you can see that we’re attempting to grow an orange tree on the side of the house), so there’s plenty of green already, and things feel pretty heavy overall. More bushes just made the entire front yard feel too full and visually overstuffed, and we wanted to bring in some color and flowers to brighten things up a bit. Once we knew what our overall wants and needs were, it was time to dive in and get started. 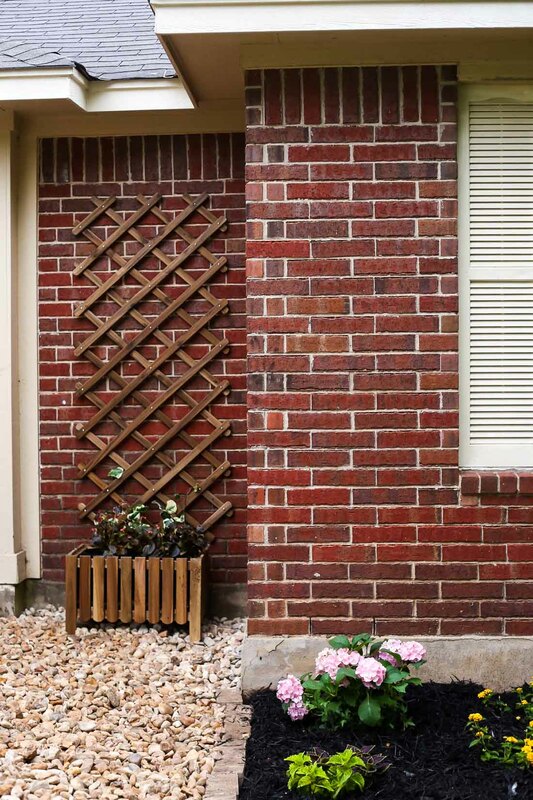 Let’s chat about the flower bed first – we wanted to do something larger on either side of the window but, like I mentioned before, we wanted to avoid a bush. 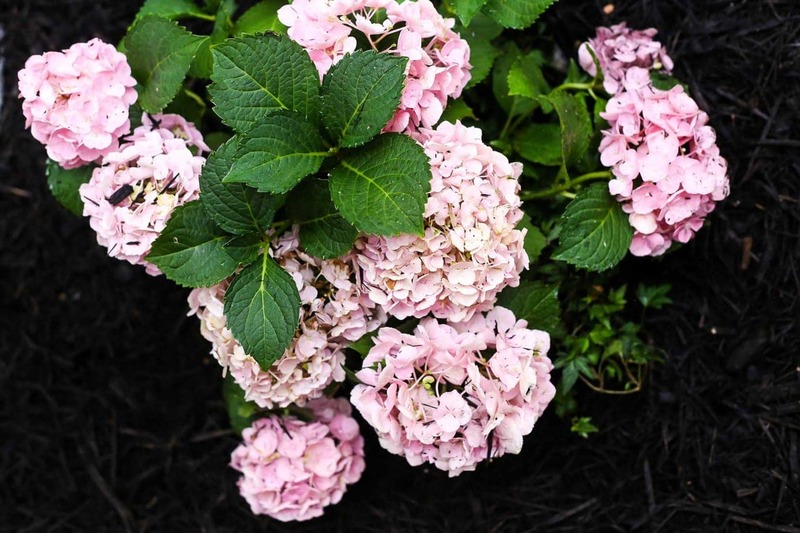 After browsing around at Lowe’s for a while and debating the different options, we landed on hydrangeas – “big leaf” hydrangeas, to be specific. Our research told us they were great for our gardening zone, do well in partial sun (which is just what this bed gets thanks to the big trees in our yard), and require very little pruning. They grow up to 6 feet tall (and up to 5 feet wide), so over time they should fill in really nicely and be really impactful in this little flower bed. They’re supposed to grow relatively quickly, and as long as I remember to water them daily (our Texas summers will dry the soil out quickly), we should be able to keep them going! Once we chose the hydrangeas, we needed to add in other plants to fill in the rest of the bed. I wanted something leafy (but not all green!) and fell in love with these cute little coleus plants. My research told me they are incredibly easy to care for (that’s what I like to hear!) and I loved the multicolored leaves. And finally, we filled in the rest of the bed with some simple lantana (the yellow flowers). Corey’s parents always had lantana in their front yard growing up, and he remembered it being simple to take care of and really beautiful once it fills in – fingers crossed! Once all three of these plants fill in a bit, I’m thinking we’ll have a really full, colorful, and fun-looking flower bed. Of course, that’s assuming we can keep them all alive that long! But, I haven’t let you in on my secret yet. I mentioned that Harvest Organics was sponsoring this post, but I haven’t gone into details on just why I love working with them so much. 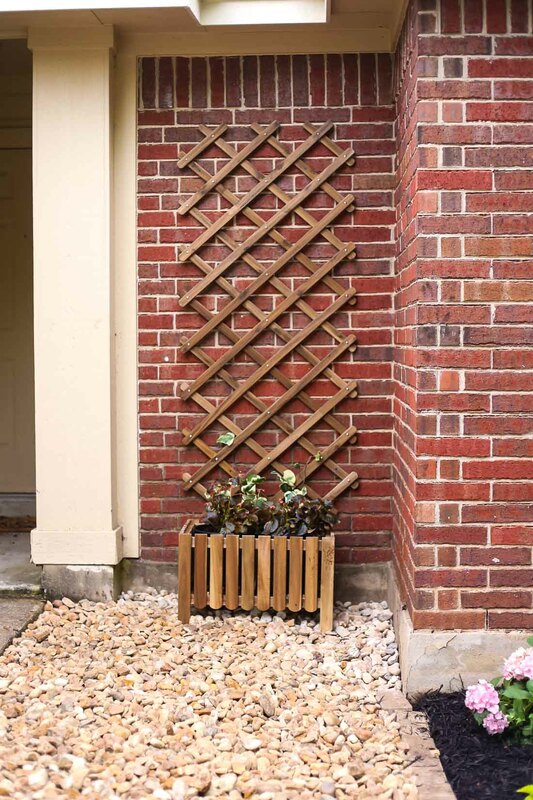 You may remember that we partnered up with them last summer to create the first gardening project that I was ever super proud of – our succulent ladder garden. That project didn’t survive the move because this yard doesn’t get nearly enough sun to keep succulents alive and healthy, but we absolutely loved it while it lasted. But, other than the fun project, what I loved most was the fact that the plants stayed alive! 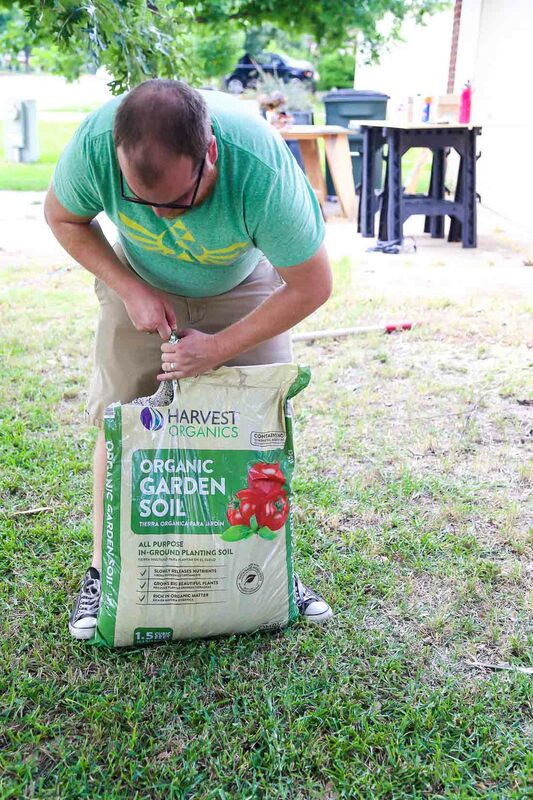 Harvest soil is all organic and completely stuffed full of nutrients that are great for your plants. They have specific varieties of soil for different applications in your yard – for example, we used their Organic Raised Bed Mix when we built our raised garden bed (which is still going strong, by the way! ), and I exclusively use their Organic Potting Mix when I’m planting houseplants or other plants in containers. For this project, we added in a few bags of their Organic Garden Soil as we were planting our new plants. 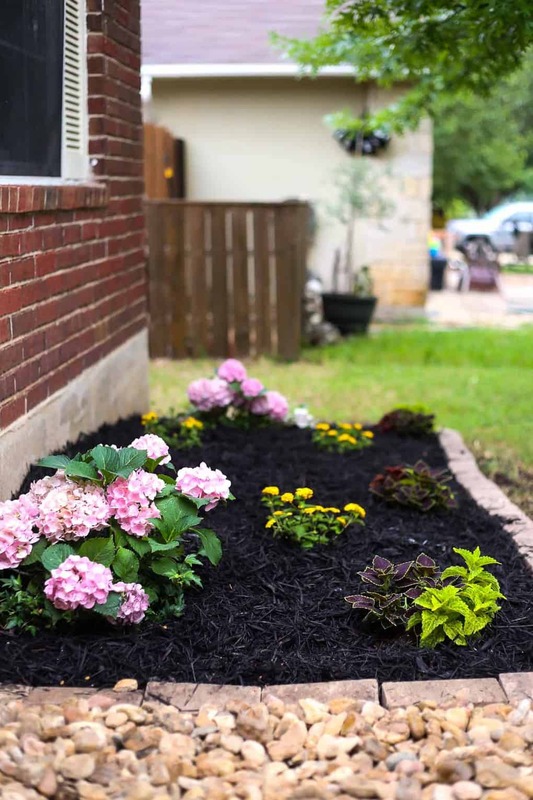 The soil here in central Texas is full of rocks and not really awesome for keeping plants alive, so it’s important to add in some nutrient-rich soil that will help your plants thrive. 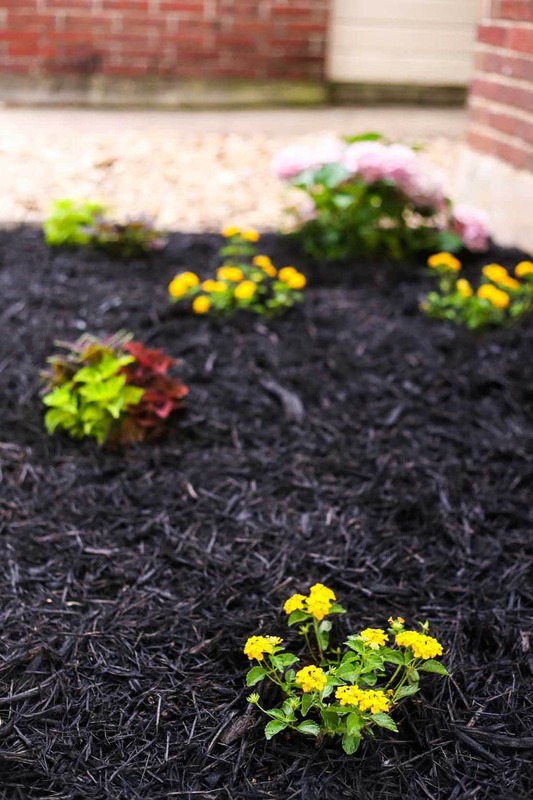 I think it’s also particularly nice that you don’t have to add any additional chemicals to your beds to help the plants grow – thanks to the nutrients that are already in the soil, I can keep my flower bed (and, as a result, my entire yard, pets, and family) healthier and greener. And, I’m not saying Harvest Organic Soil has magical powers, but I never kept a plant alive for longer than a month until I started using it. Now? I have plants that have been going strong for over a year and I’m actually growing real food in my backyard. All I know is that when I find something that works I stick to it – and the soil that Harvest Organics produces is one of those things. I also love their entire messaging – their tagline is, “Don’t Just Garden – Harvest”, which really sums up what they’re all about. They love to teach their customers how to create an experience from their garden that can be passed from generation to generation. And when I think about why I want to learn how to garden, that’s at the top of my list – I’d love to share it with my kids and turn this little hobby into something that can help sustain our whole family! That’s what Harvest Organics refers to as #theharvesteffect – the cycle of sustainability that just keeps on giving to everyone. If you want to read more about The Harvest Effect, you can check out their website! Once everything was planted and ready to go, we added a super simple border to keep things contained (there wasn’t any border at all before, so just laying down some pavers made a world of difference!) and mulched the entire bed to keep the soil moist and looking pretty. The final part of our project was the annoying little area next to the front door. I mentioned earlier that it drove me pretty nutty because I knew we wouldn’t really be able to keep anything alive there and I wanted to just simplify it as much as possible and make it feel a little less crowded. We had a hard time finding a good variety of options when we were shopping (and we didn’t have time to go to our local gardening center), so we ended up landing on Algerian Ivy, mostly by default. It’s perfect for our gardening zone and doesn’t like too much sun, so it should do pretty well in this little area. You can’t plant directly into the IKEA planter (it’s slatted on the sides and bottom), so I just grabbed two large plastic planters that fit perfectly inside. I planted the ivy in the back and, just for some added color while they’re growing we added some begonias to the front of the planters. They’re annuals so by next year when the ivy has filled in a bit, we can decide if we want to add them back in or just let the ivy do its thing. For now, I like that they fill in the gaps a little and make things look a little less empty. And, of course, the final step to our front yard landscaping adventures was to add some Colorado river rock to this section of the bed. I hated the bare mud look that was there before, and I’ve known for a while that I wanted to do some simple rockscaping here to make things look a little bit cleaner. We hit up our local rock & landscaping supply store and got a cubic yard of this rock for just $59. I don’t know if you know what a cubic yard of rock looks like but, um, it’s a lot. All we did for this was level out the soil, lay a weed barrier, and then shovel the rocks in until we were happy with how it looked. I make it sound easy, but it was a lot of physical labor and poor Corey had to do most of it alone because my 6-month-pregnant self can only handle so much. 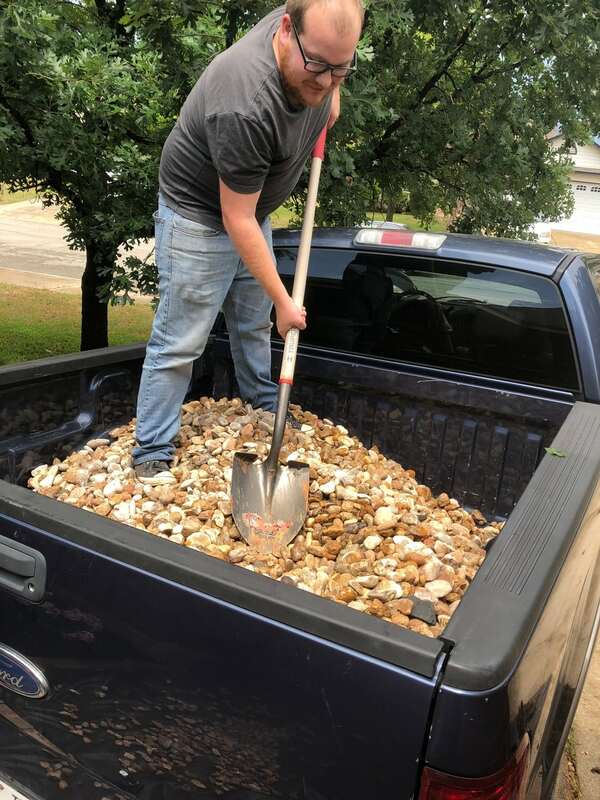 We actually ended up using only about half of the rocks we purchased, so we still have a giant pile of rocks sitting in our driveway waiting to be put to good use (our neighbors just love us). I’ve been wanting to add some rockscaping to a few spots in the backyard for a while now, so I’m thinking that project will be on the agenda as well this summer! Overall, I’m super pleased with how this project turned out and I don’t cringe when I walk up to my house anymore, which is a total win. Our front yard landscaping makeover isn’t quite done yet, though. 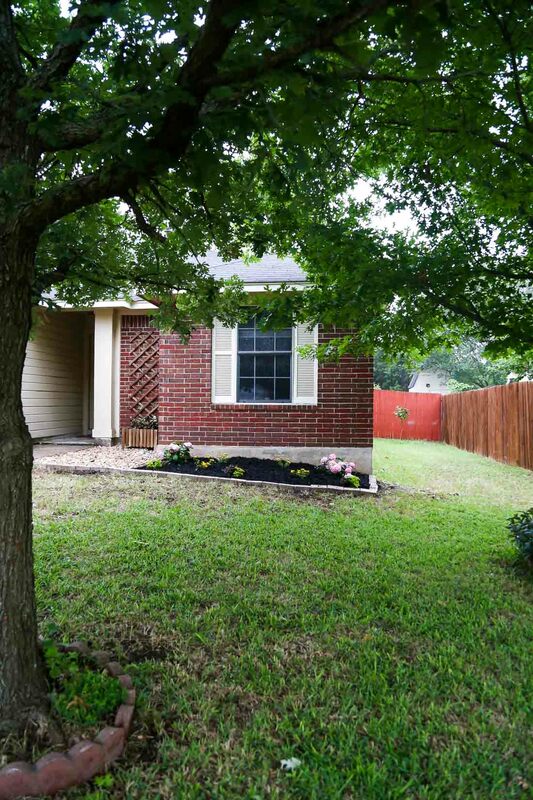 We still have to trim a few trees, replace some of the flowers under the trees (they all have different things planted under them, and I’d like a more cohesive look), and I’m dying to give our front door a makeover. You know how it is around here – the to-do list never ends! 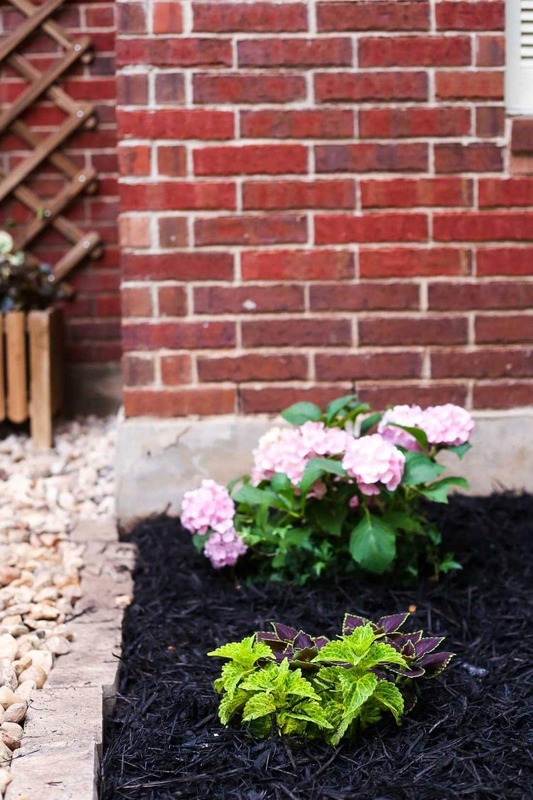 If you’re looking for some simple front yard landscaping ideas, I hope this post got your brain churning a bit and helped you realize that sometimes you just have to dive in, even if you don’t really actually know what you’re doing. Fake it ’til you make it, my friends! I also encourage those of you who, like me, consider yourself plant killers to give Harvest’s Organic Garden Soil a go. I’ve been so pleased with how it helps me keep my plants going, and it’s officially the only soil I’ll buy anymore. Next up on my outdoor to-do list? Bust out the pressure washer and do some cleanup! I’m also looking to replace our front door, so if you have any suggestions for brands or what you love about your front door, let me know! Want Some More Gardening Ideas? Great job with your garden! The flowers will look great when they fill out. In a few years, those hydrangeas will get really tall. My mom had them in her yard, and they really spread out too. I plan on planting my garden soon, but I want to add features that will look pretty while I wait for my plants to fill out, like some sculptures or birdbaths. That’s what we’re hoping for the hydrangeas! I’ve seen some big bushes that are just gorgeous!